Thatched rondavel with cool blue & white decor.Old fashioned bath in bathroom en suite. Fireplace, TV, fan, heater,barfridge,kettle,microwave. No kitchen. 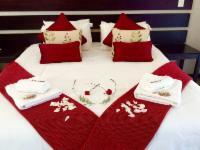 Very cosy and romantic with double bed. Outside mobile braai and limited cutlery & crockery. Zebra theme in white and black . Queen bed, shower in bathroom en suite and double basins. Coffee/tea making facilities, TV, fan & heater. Honeymoon suite, with extra luxury! Spacious with TV, radio, aircon. Double shower, spa bath and double basins. Seperate unit .Entrance in boma/braai area. Luxury spacious open plan room with \king bed or 2 x single beds, with corner bath and privatet toilet, bar fridge, fan &TV. Private entrance, small patio with small garden. View into open garden with pecan trees and Blesbok grazing peacefully! Beautiful renovated farm house for self-catering on game farm 10km from Winterton, KZN. 4 x double bed rooms with 3 x bathrooms to share. Peaceful and tranquil in nature. If cancelling 14 days before arrival, forfeit 100% of the deposit. If cancelling 28 days before arrival, forfeit 75% of the deposit. If cancelling 998 days before arrival, forfeit 50% of the deposit. If cancelling 999 days before arrival, forfeit 7% of the deposit.